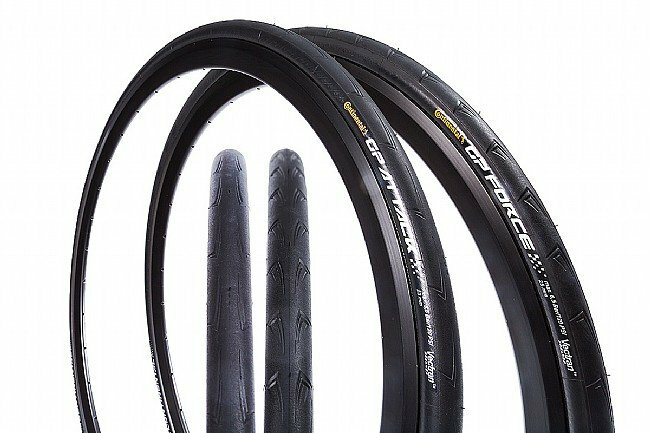 Continental's Grand Prix Attack/Force Tire Set benefits from Continental's ultra-dense Black Chili compound for a fast roll with extended durability and exceptional grip. With a 23mm contact patch up front, and a 54mm width for the rear tire, the Attack/Force Set delivers a superb blend of aerodynamics, power transfer, and handling that traditional sets can't touch. A Vectran puncture breaker keeps out sharp objects without slowing you down or negatively effecting the tire's ride quality. Water dispersing channels improve traction in wet conditions. The Grand Prix Attack/Force Tire set includes the Attack Front Tire in 700c x 23mm (23-622 ISO) and the Force Rear Tire in 700c x 25mm (25-622 ISO). Each features a 3 ply casing for a total of 330 TPI. 110-120 recommended PSI. Claimed weights: 200 grams/200 grams. Black. This is my second season on these and they have served me very well. Now on my second set, the first set got some cuts on the front and the rear wore out. The rears develop a flat area in the middle of the tread long before you reach the bottom of the wear indicators. While you still have lots of wear left, sometimes the rubber at the bottom of the indicators falls out revealing the white fabric underneath, no worries. I run them at 100psi and they sing along the pavement. Mindful of their light weight (and cost), I probably ride slightly further to the left than I would with say Conti 4 Seasons tires. Only flat so far is a pinch flat when I didn't see a pavement seam hidden in shadow at a construction site. I've used this set up on 7, 12 IM's and 1, 140.6 with no challenges at all. A very fast durable tire!!! I love these tires. Great on trackrace bike. They don't last as long as GPs, but they're a totally different application. Recommended for your sprint ride and they'll take plenty of use, but don't expect to do a ton of centuries on them.